Jerry Jones invites you to come party at his house. But even Jerry has a few rules that you must follow when tailgating at AT&T Cowboys Stadium in Arlington, Texas—for your own safety as well as the safety and enjoyment of all guests. If you don't abide by the rules, you might lose your tailgating privileges and get ejected from the parking lot. Tickets are too expensive these days— so be sure to follow the rules and have a great time. It's ok to dress like a cowboy but leave your guns at home. And your political banners, cajun turkey fryers and fireworks too. There should be plenty of parking at Jerry World. You just may have to walk a little so wear comfortable shoes. There are about 12,000 parking spaces in 15 numbered lots at Cowboys Stadium. In addition, there are almost 12,000 parking spaces in lettered lots around the Texas Rangers Ballpark that may be used on an event day. Parking areas are generally open five hours prior to Cowboys games. That should allow a sufficient amount of time to barbecue and get ready for some football. Exactly Where Can I Tailgate? 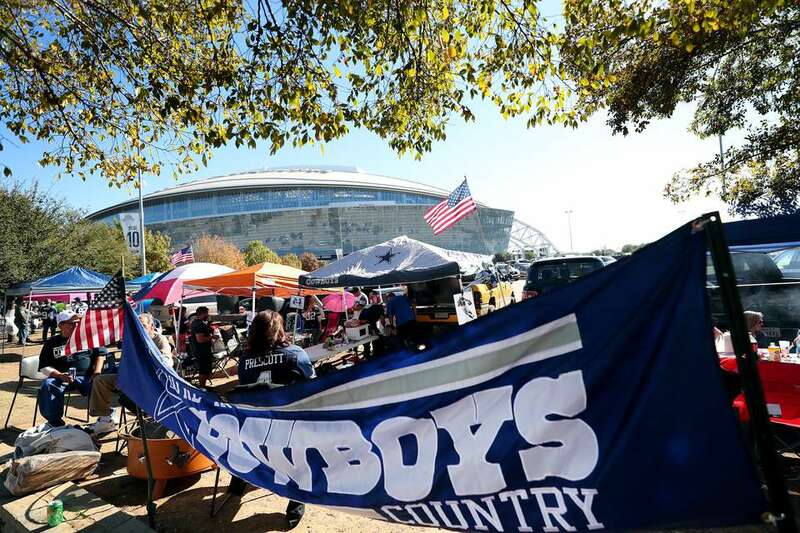 Tailgating for Cowboys games is permitted in designated tailgating spaces only. These spaces are located on the perimeter of each parking lot and have a grassy area immediately behind the vehicle parking spot. There are tailgating spaces in Lots 4, 5, 6, 7, 10, 11, 12, 13, 14 and 15 and the spaces are filled on a first come/first served basis. If interested in tailgating, it is important to arrive early to obtain one of the designated spaces. Tailgating is not permitted in Lot 3, portions of Lot 5, Lot 8 and Lot 9. Tailgating is permitted from the time the lots open and up to two hours following Dallas Cowboys or college football games. No littering. Dispose of trash in the appropriate receptacles. Be careful if you barbecue. Coals must be disposed of in the designated coal containers located throughout the lots. Do not dump coals or store stoves on the grass, parking areas, under or around vehicles. No open flame fires of any kind. Charcoal/gas cooking is OK.
You can't save a parking place or tailgating spaces for anyone. No selling food, beverage, merchandise, etc. No advertising or promoting any third party products (including but not limited to food and beverage products). No amplified sound systems or the use of radios/audio devices at loud levels.